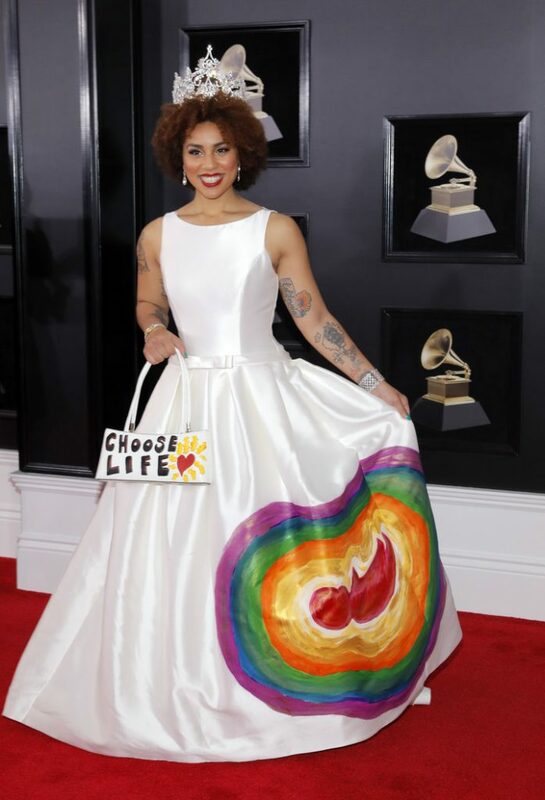 February 10th, 2019 – Singer, songwriter, and red carpet fashion troll Joy Villa didn’t let a little rain stop her from feeling the music of her MAGA-loving heart at the Grammys tonight. Villa released an EP in 2014 but has gained just as much, if not more, attention for her politically-themed fashion choices at award shows. 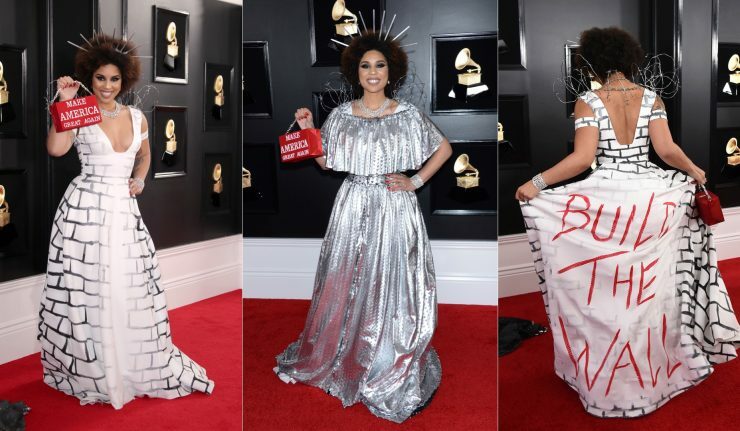 For the 61st Annual Grammy Awards, she took to the red carpet wearing a dress that encouraged President Trump to move forward in building a wall on our southern border despite failing to secure a promised check from Mexico. Villa wore a full-length, textured silver dress with circled barbed wire coming out of her shoulders and a headband full of metal spikes. To finish off the look, she wore chainmail jewelry and a red “Make America Great Again” purse. Villa, who is described as a “singer, songwriter, actor, producer, and health coach” on Apple Music, switched into another gown advocating for the wall a little more explicitly. On the back of a bricked white dress, “BUILD THE WALL” was written in red. “I don’t care what anyone thinks. I 100% support the wall & our President @realDonaldTrump. Do you want more drugs brought in? (70% of heroin is from Mexico) More illegal women getting sexually assaulted (1 in 3 who try to make it in)? More children being trafficked? (Thousands a year) because I DO NOT! 🇺🇸🇺🇸🇺🇸,” she wrote on Instagram. This isn’t Villa’s first time causing a stir on the red carpet. 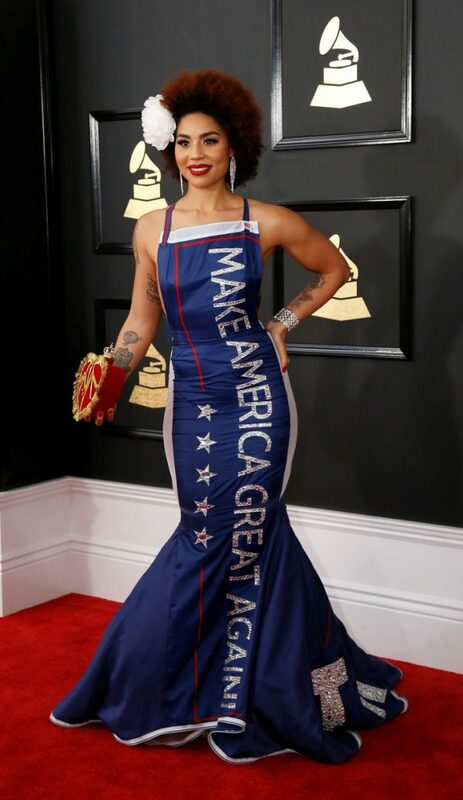 Last year, she wore a pro-life dress on the red carpet, and in 2017 she wore a red, white, and blue MAGA dress. Expecting questions about her fashion statements, Villa was ready with a pro-Trump sound bite. “I’m part Latina. I’m black, and I believe in what the president’s saying. So this, to me, is a representation of that in a very couture way. And, like you said, I always make a statement,” she said in a red carpet interview. Twitter users were quick to point out that she does, in fact, make this statement every year. Many people expressed exhaustion with trying to act surprised or interested while others praised Villa and were happy to see different views on display in Hollywood. Keep it up. Whether or not people agree with you, it’s nice to see both sides represented in Hollywood. 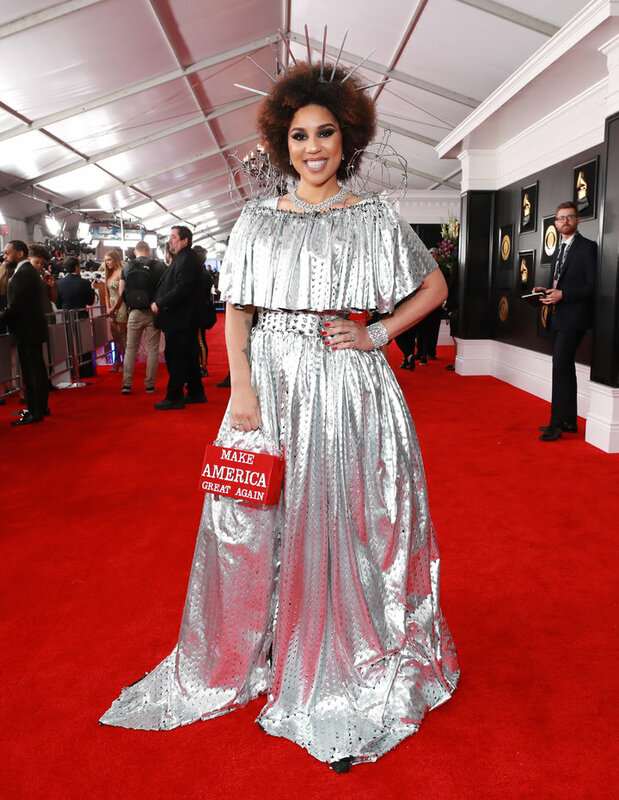 The Grammys are currently still being passed out at the Staples Center, and Joy Villa is still talking about her wall gown on Twitter.